A Southern pantry staple that tastes amazing drizzled over steamed greens. Clean the jar you are going to be using in the dishwasher or boiling water. Bring vinegar to a boil. 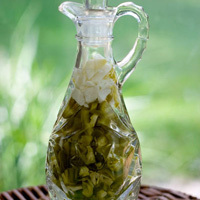 Wash peppers and either chop then to fit in your jar or put a little cut in them so that the vinegar penetrates them. Trim top stems. Add peppers, garlic, and peppercorns to jar. Pour boiling vinegar over peppers. Make sure peppers are completely covered with vinegar. Leave a little air space in between the vinegar and the lid; close the lid. Let it sit for a few weeks and enjoy.